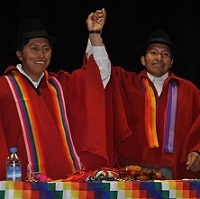 With calls to return power to the bases and to mobilize the grassroots in defense of the rights of community access to water resources, Ecuador’s largest and most powerful Indigenous federation has inaugurated its leadership for the next three years. 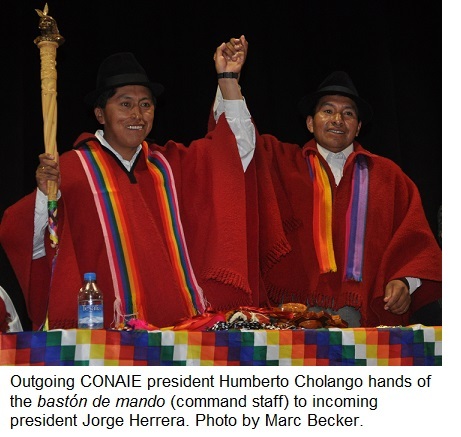 At a two-day congress in Ambato on May 16-17, the Confederation of Indigenous Nationalities of Ecuador (CONAIE) elected Jorge Herrera as its new president. At the end of the organization’s Fifth Congress, Herrera said “we will strengthen the organizational bases of our nationalities in the Amazon, on the coast, and in the highlands.” He vowed to achieve the goals of a plurinational state through unifying the movement by building on the strength of local water boards and youth and women’s organizations. Herrera was the candidate of Ecuarunari, the federation of Kichwa peoples of the Ecuadorian highlands. He is from the Wintza community in the parish of Toacazo in the central highland province of Cotopaxi. He was previously a leader of the Indigenous and Peasant Movement of Cotopaxi (MICC). More than two thousand delegates selected Herrera over Mónica Chuji from the Amazon and Olindo Nastacuaz from the coast. The congress also passed resolutions in favor of a national march in favor of life and water, opposition to extractivist policies, defense of those facing criminal charges for their involvement in social protests, support for the community of Sarayaku for sheltering political dissidents, and respect for bilingual education. Indigenous activists formed CONAIE in 1986 in order to fight for their social, economic, and political rights. During the 1990s, CONAIE was a leading force against neoliberal economic policies that privatized access to resources. 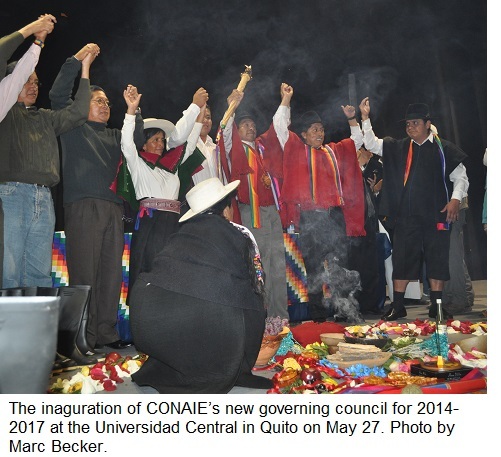 CONAIE’s successful organizing efforts paved the way for the election of leftist president Rafael Correa in 2006. CONAIE leaders contend, however, that in privileging access of private industry and transnational corporations to hydraulic resources that the government is continuing the same neoliberal economic policies as previous governments. In a rousing speech at the inauguration of CONAIE’s new governing council on May 27, historic leader Luis Macas reiterated Herrera’s call to return to the movement’s roots in local communities. Franco Viteri, president of the Government of Original Nations of the Ecuadorian Amazon (GONOAE) reflected that he was only 24 years old when Macas led a historic 1990 uprising that solidly placed Indigenous issues on the country’s political agenda. Today, he is leading the regional Indigenous federation in the Amazon to assure that never again would their concerns be ignored. Herrera immediately set to work to achieve CONAIE’s goals, with a particular emphasis on forcing a revision of a proposed water law. On May 30, representatives of Indigenous organizations assembled in Quito to strategize how to approach the law. At the organizing meeting, Ecuarunari president Carlos Pérez proposed five points: stop the privatization of water, creation of a Plurinational Water Council, halt mineral extraction that uses most of the water resources, create a national fund for water, and administer water resources on a community level. After four years of parliamentary discussion, on June 5 the Organic Law on Hydraulic Resources, and Use of War (commonly known as the Water Law) passed to its second and final debate in the National Assembly. Indigenous representatives arrived in force to the assembly to make their concerns about the law known. CONAIE leaders want water resources to be administered in a manner consistent with the plurinational dictates of the progressive 2008 constitution. The Correa administration wants to treat water as a strategic resource that will be administered in line with the interests of the state. CONAIE has yet to set a date for a mobilization in defense of community access to water rights. Some militant leaders are pressing for immediate protests, while others want to take time to organize at the grassroots level before building up to a national-level mobilization. Joining Herrera in CONAIE’s governing council for the period 2014-2017 are Rómulo Acacho (vicepresident), Floresmilo Simbaña (director of strengthening and policy), Severino Sharupi (director of territory, natural resources, environment, and development), Tomás Morocho (director of international relations) Adolfo Chapiro (director of education, science, and technology), Katy Betancourt Machoa (director of the women and families), Francisca Masaquiza (director of health), Rumi Yumbay (director of youth and culture), and Pedro Tankamash (director of communication). Marc Becker is a professor of Latin American Studies at Truman State University, and the author, most recently, of Pachakutik: Indigenous Movements and Electoral Politics in Ecuador.